Perhaps the way I feel about this sweater is not at all ambiguous :). 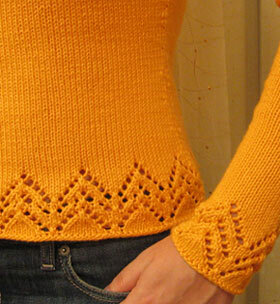 Yarn: KnitPicks Shine in Apricot, 9 skeins. Needles and gauge: US 4 Addis, 22 sts and 32 rows per 4” stockinette square after blocking. Finishing: Other than the standard wet-blocking, I ironed the seams: high setting, high steam, through thin pillowcase – ever since I discovered the beauty of pressing seams to make them flat and the garment more streamlined, I have NOT been able to stop. Finished size: 35” bust, 31” waist, 36” hip, 21.5” to shoulder. I was so excited about this pattern when I first bought it – not only was it cute, but the finished dimensions of one of the sizes would work perfectly for me. 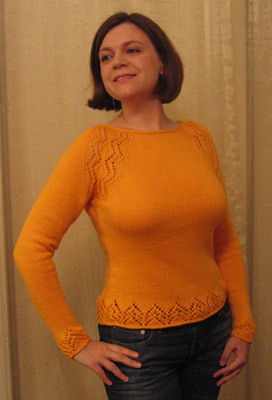 At that time I was just parting ways with the Adrienne Vittadini sweater from hell, so I was looking forward to an easy knit. But life doesn’t always work out simply, does it? The first pattern modification was made willingly and purposefully – waist shaping. But even a simple addition like that didn’t go smoothly since I failed to take into account that the lace at the hem was going to stretch like a mofo. Good thing Operation Orange Overload was a success and the fix wasn’t much of a hassle. I was hoping the pattern would make the rest of my knitting experience simple by writing clear and accurate instructions, but I knew I was in trouble when the cast-on instructions didn’t correspond to the size of lace repeats. The rest of the pattern didn’t get any better, and a cursory glance would certainly lead one to believe that the writers were high on bunny crack when they published this nonsense. A perfect example is the sleeve instructions, which are SO wrong, you’ll make a tea cozy or a cabled children’s hat depending on how you interpret them. I ended up re-writing them. And then we get to the neckline. Ah yes, the neckline. 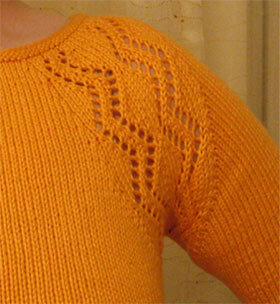 After all the pieces were knit, I proceeded to start seaming. With enough seaming completed to sort of “try on” the sweater, it became immediately obvious to me that the neckhole was incredibly wide. Like, “fall of my shoulders” wide, not, “cute boatneck” wide. I wish I had the patience to take a picture of that: it would make great blogging material – I looked ridiculous. And very angry. In fact, I was so dumbfounded, shocked, and pissed off by what I saw in the mirror, that I tore off the half-completed sweater and started frogging before you could say, “Lifeline, crazyass Grumperina, lifeline!” There was much cursing, squinting, frogging, wishing for a lifeline, and referring to bunny crack. The fix took only (deep breath) knitting another 4 or 5 pattern rows after the whole thing was seamed (don’t even ask how I managed to do that), significantly decreasing the number of stitches in the front and back portions, changing the neckhole edging to be slightly more substantial, knitting the neckhole edging on smaller-sized needles (two rows on US 3, then two rows on US2), and a wee bit of a heart attack. All along my yarn of choice wasn’t helping. I would describe KnitPicks Shine the same way I describe KnitPicks Merino Style – fragile; will never stand up to frogging and falls apart in your hands like cotton candy. But, damn, it’s soft and silky, and the stitches are crisp enough to knit by touch only. I think I’d use it again as long as I knew there’d be no chance of extensive frogging, and as long as the project was mainly stockinette – knitting the lace patterns using this yarn made my hands hurt. And now I’m going to stop complaining because this thing is too damn cute and fits too perfectly to be pissed off any longer :-D. It was worth the headaches.